Charlotte wears a vintage jacket by Christian Dior and shirt by Isabel Marant. Hair Products by Fekkai. 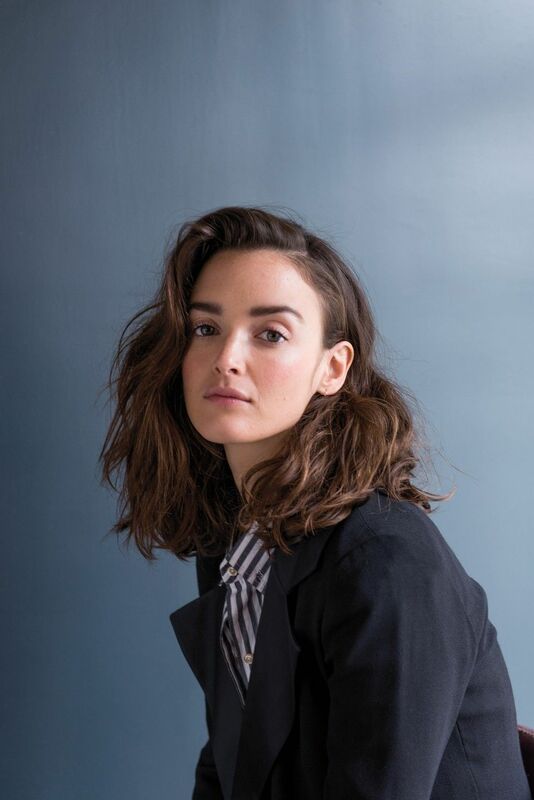 Although she's starring as the early Dior muse Victoire Doutreleau in this summer's designer biopic Yves Saint Laurent, the 27-year-old French-Canadian model-turned-actress Charlotte Le Bon doesn't want to talk about fashion. "I was a model for eight years and really hated it," says Le Bon. "I really hate the fashion business even though I spent a lot of my life in it. The thing that really excited me about this project was Yves Saint Laurent, because he was an artist before everything else, but super humble. And that's inspiring because in fashion, people tend to believe that they're superheroes or gods or something." The Weinstein-released film is one of two battling biopics being released this year honoring the late designer who took over the house of Dior in 1958 before starting his eponymous brand. The glamorous Doutreleau became Laurent's favorite model and social sidekick. Despite her own power to inspire, Le Bon found the role to be a challenge. "It was the first time I incarnated a real woman," says Le Bon. "She was a really confident and strong woman, not just a little bubbly girl. She takes her beauty for granted and she knows the impact she has on others -- men especially -- and that was difficult for me." Charlotte wears a sweater by Isabel Marant, socks by Falke and earrings by Sara Lasry. Charlotte wears a vest by BLK DNM, shirt by Carven, earrings by Sara Lasry and rings by Monsieur. But don't be fooled by her Saint Laurent-style modesty; Le Bon's already a famous face in France and is set to make a big impact in Hollywood. This summer, following Yves Saint Laurent, she'll appear in Michel Gondry's latest, Mood Indigo, out July 18, and alongside Helen Mirren in The Hundred-Foot Journey, produced by Oprah and Steven Spielberg. All while filming next year's To Reach the Clouds, a 3D dramatization of enfant terrible Philippe Petit's 1974 tightrope walk between the Twin Towers, starring Joseph Gordon-Levitt and Ben Kingsley. Born and raised in Montreal to actor parents, Le Bon left home at 19 to travel the world as a model before landing in Paris in 2011. "I sat down with my agent at that time and she told me that, at 23, I was getting old and I really needed to settle somewhere to give my last shot to modeling," explains Le Bon with a laugh. But it wasn't her modeling career that began to blossom. "A woman working at this French channel called Canal+ saw a picture of me where I was doing a silly face with my tongue out -- like a very, very ugly face -- and she said, 'I want to meet this girl.'" Two weeks later, Le Bon was cast as the "weather girl" on the channel's pop culture news show Le Grand Journal, where she wrote and performed nightly newscast parodies. "I just learned that being ridiculous doesn't kill you," says Le Bon. "It makes you stronger. It's good for the ego." Charlotte wears a jacket by Balmain, top by Mimi's Beer, vintage 501 jeans by Levi's, sunglasses by Martine Sitbon. Lip color by NARS.